Product #60576 | SKU 3-102 | 0.0 (no ratings yet) Thanks for your rating! 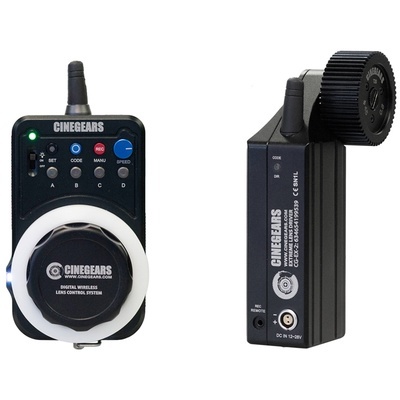 The Cinegears Express Kit Wireless Follow Focus with Extreme High-Torque Motor allows you to set up a wireless lens control motor and controller system on your camera system equipped with geared lens and either 15mm or 19mm support rods. The full-sized lens controller allows you to adjust the end points to programme focus stops. The kit includes two 2" (5cm) rod clamps with mounting brackets and 15mm and 19mm rod clamps, allowing you to mount the included lens control motor on either size rod. A third clamp is approximately 3" (7.6cm) long and mounts to a 19mm rod, or a 15mm rod using the included adapter bushing.